This is our "modern-meets-traditional" lamp. 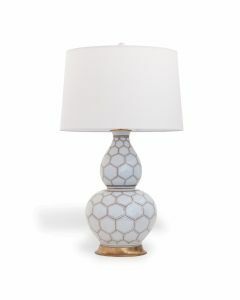 Featuring solid brass accents and a rich deep blue glaze, this porcelain lamp is a classic. 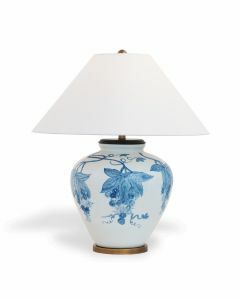 At 32"height, it is scaled for the lamp table, dresser or bedside. This lamp goes so many places in the home. Features a 3 way switch and aged brass metal finial. It takes a 150 watt max bulb. 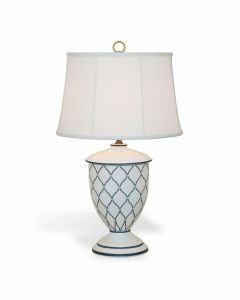 The tapered hardback shade with single fold self trim measures 12" x 19" x 13”SH and is made of an off white polyester fabric with brass spider. Lamp measures 32"H x 19"D . Click on images for greater detail. Eligible for return within 7 days of delivery in original packaging. To view our full return policy, please visit our customer service page.